Hidden Valley gold mine’s Chemistry Laboratory is now certified under ISO/IEC 17025 Standard. The International Organisation for Standardisation (IS0) and International Electrotechnical Commission (IEC) 17025 Standard is a general requirement for the competence of testing and calibration used by laboratories in the world. Hidden Valley’s laboratory was certified under this standard through the PNG Laboratory Accreditation Scheme (PNGLAS) of the National Institute of Standards and Industrial Technology (NISIT). 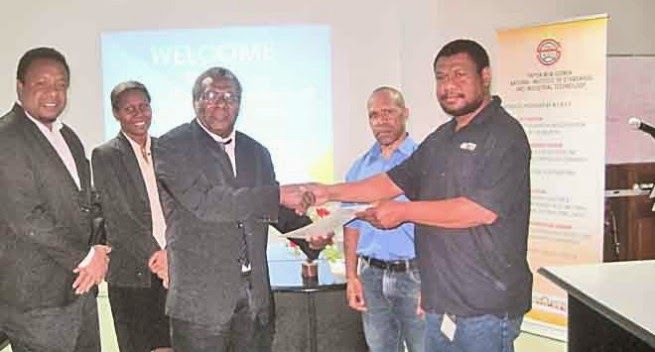 Morobe Mining’s Environment Manager, Edward Nicholas, who received the certificate in Port Moresby on June 29, said it was a milestone achievement. Mr Nicholas said not only will there be significant cost reductions in analytical services but more importantly it will provide a working environment conducive for professionals to be developed in this area of environmental management and monitoring. In presenting the certificate, the Director General of NISIT, Victor Gabi mentioned that obtaining accreditation to such international standards is a long process and congratulated the mine on the hard work and high standards it showed in obtaining the certification. Hidden Valley General Manager, Bevan Jones, and General Manager Sustainability & External Relations, David Wissink, congratulated the team and said this also provided the opportunity to continue developing the local capacity to work in the laboratory. Work began in October 2012 to document the laboratory quality management system to conform to the standard and all drafts were completed in January 2013. An external review was completed in March 2013 and the laboratory commenced implementation of the system in April of the same year. An external audit was carried out by PNGLAS and National Association of Testing Associations (NATA - Australia) on the system in July 2013. The laboratory satisfied all conditions raised by the auditors in December 2013 taking 13 months in total to complete the process. Since then, the laboratory has participated in a number of proficiency testing programs which compares the performance of similar testing laboratories in the Asia-Pacific region and has done well particularly for Weak Acid Dissociable Cyanide (WADCN) and Total Cyanide (TCN) testing.